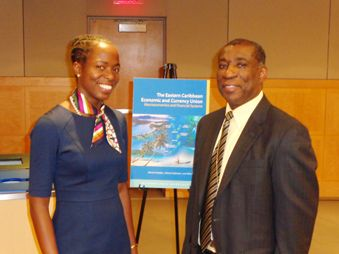 They are Wendell Samuel, Deputy Division Chief of the Caribbean II Division (former Regional Resident Representative for the Eastern Caribbean Currency Union (ECCU)) and Jehann Jack, economist in the ECCU Regional Resident Representativeâs Office. Alfred Schipke, Division Chief in the Asia Pacific Department (former Division Chief of the Caribbean I (ECCU) Division), Aliona Cebotari and Nita Thacker, both Deputy Division Chiefs of the Caribbean I (ECCU) Division edited the publication, which was officially launched at the IMF headquarters in Washington, DC, last Thursday (May 9, 2013). Min Zhu, Deputy Managing Director of the IMF, delivered opening remarks for the event, which included a panel discussion that was moderated by Adrienne Cheasty, Deputy Director of the Western Hemisphere Department. Co-editors Alfred Schipke and Aliona Cebotari provided an overview of the book. The panel also comprised FranÃ§oise Clottes, Country Director for the Caribbean at the World Bank, and Janet Harris, the World Bankâs Alternate Executive Director for Canada, Ireland, and the Caribbean (former Financial Secretary, Saint Kitts and Nevis). Among the attendees at the book launch and seminar were international diplomats, including Ambassador La Celia A. Prince. As in other parts of the world, in the aftermath of the global economic and financial crisis, the region is at a crossroads, facing the major challenges of creating jobs, making growth more inclusive, reforming the banking system, and managing volatility, while grappling with high public debt and persistent low economic growth. The publication also features reviews from the Dr Denzil L. Douglas, Saint Kitts and Nevisâ Prime Minister and Minister of Finance; Professor Jeffrey A. Frankel of Harvard University, John F. Kennedy School of Government; and Dr Lester Henry, Lecturer in Economics at University of the West Indies, St Augustine, Trinidad and Tobago. IMFâs Managing Director Christine Lagarde penned the foreword.